Cytomegalovirus and cryptosporidiosis are becoming relatively common pathogens, due to acquired immunodeficiency syndrome (AIDS). Patients with CD4 lymphocyte counts of 200 mm3 or less are at greatest risk for these infections. Typically, the cecum and proximal ascending colon are affected by these organisms, however, a pancol-itis with continuous lesions may occur. CT shows mural thickening of the involved segments of colon, with low attenuation in the region of the submucosa due to edema as well as pericolonic fluid and standing of the adjacent fat. 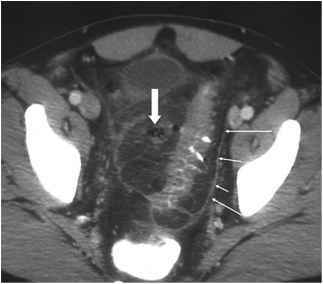 Pneumatosis and ascites have also been described .